Acting Jobs>Web Acting Jobs>Collaborators/YouTubers Wanted for YouTube Channel Videos! Following VidCon Australia in 2017, I have finally taken the next step after 7 months to start up my YouTube channel and I'm quite excited about it! One of the things I'm most looking forward to about my channel is getting to collaborate with other amazing creatives and awesome people around Melbourne (and people inter-state if they travel to Melbs!). At the moment my channel will have a pop-culture focus with different styles of videos from vlogs, to trailer reactions, movie reviews, unboxings and more! But don't let the pop-culture theme discourage you. I'm also considering bringing my passion for photography onto the channel and I'm always open to new and different ideas. 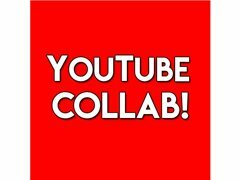 So if you're a Melbourne YouTuber looking to collaborate or just someone who has a cool idea for a video, let me know and we can get talking! Of course, this is a two-way street so I can help you out with a video on your channel too if you would like. TBD in chats before the shoot days. Dependent on the video itself and it's content.